From time to time I am blessed by a letter from my friend Tom that includes a summary of something he has been studying. Tom is a Messianic Jewish believer in Yeshua and is currently incarcerated. This week I received something from him about Torah Portion Vayikra. We don’t always agree on everything, but it is my honor to share with you here what he sent to me just the way he wrote it. I hope you enjoy it. 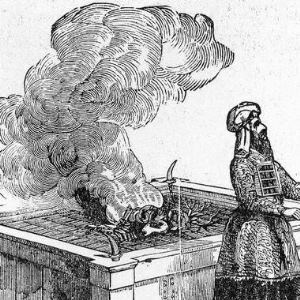 The Olah or “burn offering” is a voluntary sacrifice that had a high degree of sanctity and is regarded as the “standard” offering. The entire animal except for its hide is burned on the altar. The Minkhah or “meal offering” is a sacrifice made of flour, oil, salt and frankincense that is partly burned on the altar and partly given to the priest to eat. The zevakh sh’lamim or “sacrifice of well-being” is a voluntary animal offering from one’s herd, sometimes brought to fulfill a vow. The khatat or “sin offering” is an obligatory sacrifice offered to expiate unintentional sins. It is important to note that this offering differs from the others in the special treatment of the blood of the animal. The asham or “penalty offering” is an obligatory sacrifice of a ram that is chiefly required of one who has misappropriated property. Sacrifice: 1. The offering of an animal, plant or human life or of some material possession to a deity as in propitiation or homage. 2. Something that is so offered. 3. The surrender or destruction of something prized or desirable for the sake of something considered as having a higher or more pressing claim. 4. The thing so surrendered or devoted. The word is derived from the Latin “sacer” meaning “holy,” the same Latin root that is found in a word like “sacerdotal” meaning “priestly.” But that is not what Parasha Vayikra says. The Hebrew word used to describe all the offerings detailed in this Torah portion is korban, and it has a very different meaning – “that which is brought near.” Literally, of course, it is the offering that is brought near to G-d but, I think it likewise implies that the offering, if brought in the right spirit, is the medium whereby man attains to closer nearness to the Divine. Much of this Torah portion and the next are dedicated to answering a related question: What constitutes the right procedure? Judaism is very much a religion of the commonplace and the methodical, of daily occurrences and ordered procedures. In fact, much of the book of Vayikra consists of the laws governing the correct procedures for daily things like making offerings to G-d. I think that the answer to what constitutes the right spirit can be found in Parasha Vayikra, too. The answer actually suggests that the Jewish understanding of korban and the Latin-derived English word sacrifice are closer kin than one might suspect. “Without blemish.” That instruction is repeated in the description of subsequent offerings. It is repeated in nine different cases. And the animals are always taken from the herd or flock. These are never wild animals, never animals that have been rejected as having some flaw. They are the best. And in several cases males are specifically called for. This isn’t some patriarchal sexist prescription. For a farmer a male will be more valuable, able to breed almost at will, unlike females who must be in heat and can only bear once or twice per year, and stronger, able to pull a plow or an oxcart and therefore capable of multiplying the value of farmland. When a meal offering of an offering of flour is called for, the text is equally specific. It must be the finest flour and oil. The offering should include salt, which as we know was a great value of commodity in a society in which refrigeration is unknown. These are not unrefined products in their natural form but are obtained as the result of hard work. In other words what is called for in making an offering to G-d is that you give up something of value – a steer or a ram from your flock, birds that take time and skill to capture, the best flour you have to offer, with salt. This would seem to be completely congruent with our dictionary definition 3, “the surrender or destruction of something prized or desirable for the sake of something considered as having a higher or more pressing claim.” And the linking of sacrifice with the holy is inescapable. But there is important additional instruction. G-d does not expect us to impoverish ourselves in order to draw near to the Divine Presence. The laws governing the sacrifices are incredibly detailed, entailing a series of difficult choices for the one bringing and offering to Adonai. I think that the complexity of the laws governing the sacrifices reflects the even greater complexity of our relationship with G-d. In a sense, then, the answer to the question of “right spirit” is embodied in the specific circumstances of the sacrifice. When the Temple fell, the sacrifices ordained in Vayikra could no longer be brought to Jerusalem for the Kohanim. So the Rabbis looked upon a battered and beaten people, the feet of the Roman Empire’s finest soldiers on their necks and decided that the appropriate substitute for offerings would be the words of prayer we speak even today. And therein lies the answer to the question, what constitutes “the right spirit” in which to draw near to G-d. Prayer is called “the service of the heart,” and it should come from the heart, from the innermost part of ourselves. Like the offerings made in the Mishkan and the offerings made in the Temple in Jerusalem, it should be a gift to G-d given out of a sense of love, of free will. Just as Yeshua was given as the ultimate sacrifice we give our prayers as an act of teshuvah, of repentance and returning, turning to G-d. And it should be the best of ourselves that we can bring, just as G-d gave the best of himself. Brother, this Parasha hit me hard in the love that HaShem has for us.